One of my clients asked me the other day if he should be publishing his blogs as pdf files. I reacted in abject horror which probably shocked him and seemed inexplicable. So I explained myself but we realized that this may not be so obvious to small business owners. I mean, PDFs are really handy, why not use them? There are many reasons not to use PDFs for your every day content but I will cover two of them in this post: the first is a “user experience” (UX in the lingo) reason, the second is a efficiency/practicality reason for you, the business owner. 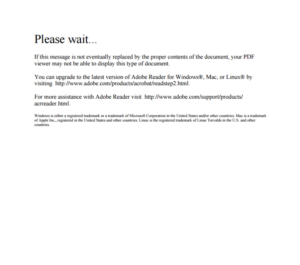 Have you ever gone to pdf hosted on a website and seen something like this instead of the PDF you wanted to read? There are many reasons why you might have received these message, but the two most common are a) your Adobe Reader plugin for your browser is not up to date or b) the browser’s own PDF reader plugin is out of date or otherwise incompatible with the pdf file you are trying to view. And this happens a lot. Most internet users over a certain age – probably most internet users in general – and certainly many of your clients will not be able to diagnose this problem and many who will be able to may not care enough about your content to bother dealing with it, they’ll just leave. Posting your daily/weekly/monthly update or any other posts you want to share as PDFs will cause at least some percentage of your users (your potential clients) to encounter this problem and so your reach will be considerably less. Using PDFs for “e-books” (and white papers and the like) makes perfect sense – it’s the preferred format for browser reading (if anyone does that any more… 🙂 ) and can be read by most (if not all) e-readers in addition to their proprietary formats. The format is good for longform documents you have no intention of editing, and it’s good for graphics embedded into longform documents. But if you’re just putting up a couple hundred word or couple thousand word post, I don’t see why you’d bother. Especially if you use a CMS, such as WordPress, where you can make edits to your content instantaneously. If you want to edit a PDF, you have to open the source document and republish, and then re-upload it to your server. Why do that when you can just edit your post? Remember: PDFs are for publishing permanent content that you don’t want to edit. Uploading your brochure or menu as a PDF is a fine idea. Spreading information about your latest sale or tonight’s special as a PDF is a huge headache and might also keep your users from learning about it.